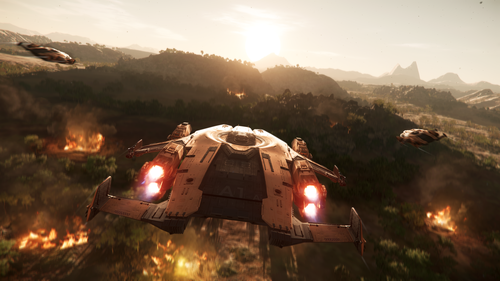 Following the launch of the Valkyrie from Anvil Aerospace, we took your community-voted questions to our designers to give you more information on the recently unveiled troop/personnel transport. If the Valkyrie can´t hold cargo, how are the players supposed to transport small supplies (ammo, food…) and weapons (like mortars or anti-tank weapons, railguns or RPGs etc…) to the front lines? The Valkyrie’s purpose is to carry troops and a vehicle down to a location, drop them off, and provide close support via its weaponry. It is very much a dropship/gunship rather than a resupply ship. While some dropships may simply drop off the team and jet, the Valkyrie is equipped to provide continued support for drop off and extraction. The troops onboard have a gunrack per seat alongside storage lockers for additional items if the crew are not using them. 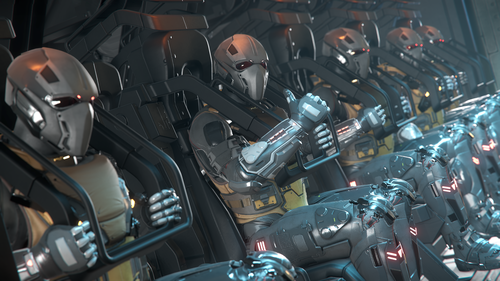 The combination of troops, FPS weapon racks, vehicle deployment, and the ability to provide close support, all makes the Valkyrie a strong candidate for when you need to get in and out planetside. What can we expect for drop ship gameplay? Can you give examples of missions or jobs that this ship could perform without having 10+ friends in game. While the ideal gameplay for this ship is dropping friends off into combat zones, naturally not everyone has that amount of friends available at all times to facilitate this being a common occurrence. Typical gameplay missions for solo or low player counts would be hiring NPCs for combat missions and transporting them to the location or retrieving groups of abandoned NPCs/players from their own missions which may have not gone to plan. At its core, this ship is designed for transporting people and a vehicle from A to B, so missions will revolve around that concept, varying the location, duration and danger of pickups and drop-offs. What can the ship do when not carrying troops; will it always have rows of empty seats taking up space, or can those be repurposed to better fit a gunship role, or some other third thing? The ship does not have any modular rooms that can be swapped out by the owner and there are no current plans to add that level of modularity to the ship. Is there a storage space for weapons, like weapon racks? Each of the 20 seats has a weapon rack for a single primary weapon up to size 4, for example an Arrowhead sniper rifle. These racks are alongside lockers on the back wall of the vehicle bay. Does it fit in an Idris/Polaris/Javelin? It does not fit in any of the above ships – it is too tall and too wide for the Idris to fit without breaking parts off. It is too long and wide to fit in the Javelin’s flight bay, and is too big in every axis for the Polaris. How is a ‘vehicle pad’, which presumably has either tie downs or a mag-lock grid to keep the vehicle in place during flight ops, different from a ‘cargo grid’, which would use those same mechanics to safely store SCUs of supplies or trade goods. Not every dropship mission is about bringing bodies to the fight – sometimes it’s ammo, fuel, food, medicine, equipment etc etc. From the very initial design, we wanted the area at the back to be purely for vehicles and not used for storing commercial cargo. Technically speaking, we do not require a cargo grid to store a vehicle for persistence reasons, instead we use the physics grid, so there is actually no technical requirement to have a cargo grid to secure vehicles. In-game, we always require the magnetic cargo grids to store commercial cargo securely in ships, and the Valkyrie does not have this functionality. We’re still finalizing the in-fiction reasons for the differences between securing cargo vs. vehicles. Will the door gunner arms be moved further center of the door to allow for better range of motion? We are reviewing the current positioning of them and seeing whether we want to move them further out. However, the restriction being that we still want to allow 2×2 exit of characters alongside the gun and as it is on an arm, the further out it is the more it blocks the exit. It was a conscious design decision to have the guns on that specific side to not allow them to have a full 180 degree arc, which the wing remote turrets cover instead. In addition, the door guns are the very first implementation of manned standalone turrets and we have plans for the future to make better use of blendspaces and IK to give a more natural pose and movement which will allow you to keep a line of sight down the gun regardless of the aim point. Will the ground vehicle ‘hook’ allow for multiple smaller vehicles (like 3 Noxes or 2 dragonflies) or it is a one vehicle only slot? Officially the vehicle capacity is 1 vehicle and when you are able to prespawn vehicles inside there will only be one slot to spawn from. However, given our future persistence plans and indeed how it works currently, if you choose to manually load more in after that point then these are saved inside the vehicle in the position they were left at. Is the ladder to the upper Habitat open to the rover bay? What about planets without an atmosphere, or poisonous/corrosive atmospheres? Will we suffocate in bed? The ladder hatch and the upper area is indeed open to the rover bay, meaning if you open the doors it will vent all the living quarters. This as an intentional design decision. The ship is designed for operations down to planets with breathable atmospheres with the crew compartment there to make the crew comfortable if they have to wait for troops to return. Obviously, if you are away and dropping into a dangerous atmosphere, you can suit up in advance to prevent injury. Could this ship be used practically for boarding action in space? While the ship is designed for dropping troops in breathable atmospheres, provided the troops are suitably equipped for EVA, there is no reason the Valkyrie couldn’t be used for boarding actions in space. The commercial for the Anvil Valkyrie calls it a “multirole ship”. How is the Valkyrie understood to be multirole? The Valkyrie is capable of dropping 20 troops plus a vehicle as well as providing a good level of weaponry for close air support to those troops. As mentioned in the trailer, it blurs the line between dropship and gunship. Real life dropship concepts (Blackhawk/Huey) have very good visibility under the pilot’s feet so they can see where are they landing. The Valkyrie does not have any visibility for below ground. Will it be equipped with some kind of below camera or something to help land it efficiently? There is actually a window beneath the pilot’s seat for visibility down under the ship. However, given constraints with our character’s movement versus how much you can move around in real life there are limits to how much you can see out of it. We know people are keen to have some kind of external camera that isn’t the third person view for our ships, and we are looking at ways of implementing that. Will Valkyrie get a medical module for Combat Search and Rescue (CSAR)? During concept, we looked at potential variants to the Valkyrie and the CSAR one was one of the most liked options. Ultimately, we chose to just create the one ship from the concept phase with no modularity available. In the future, if we choose to do anything, they will most likely be full on variants, but there are no plans to do this at this time.